In the Summer of 2011, URETEK was contacted by a railway service customer regarding a project involving railway stabilization in Baltimore, MD. Through surface observations it was determined that voids were present below a 32 inch thick concrete railway substructure. The voids were due to erosion by a constant flow of drainage water collecting beneath the ballast sub-structure. Observations of the track included a differential in elevation and displacement of large quantities of water during track occupancy by passing trains. Voids below the railbed were initially estimated by the customer to be as deep as 12 inches and encompassed several hundred feet of track. Issues with accessibility, track geometry, the presence of high volumes of water and time constraints were all major concerns of the client. 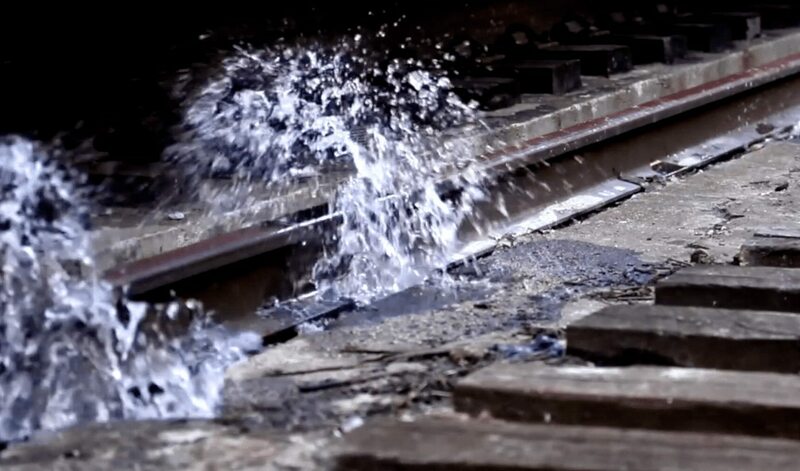 URETEK was chosen to fill the subsurface voids, eliminate further destabilization due to water infiltration, and stabilize the railbed with its high-density, lightweight, hydro-insensitive expanding polymer injection system. This solution provided the client flexibility and reduced operational downtime as the repair work was scheduled during already scheduled outages. The first section of track to be addressed, was a section of concrete railbed measuring 100 feet by 12.5 feet. URETEK technicians drilled through the railbed utilizing a predetermined grid pattern. Laser level monitoring equipment was utilized to detect vertical movement. Injections were made directly through the railbed until lift of <1mm was detected. The URETEK polymer successfully provided void fill, water elimination, and railbed stabilization. The URETEK crew was able complete work on the 100 ft. section of track in less than 20 hours including set up, tear down and sealing of injection points. The railroad’s specification for void fill, water elimination, and railbed stabilization was successfully met by URETEK’s zero-excavation soil stabilization repair method. In January & March of 2012, during two scheduled outages, URETEK returned to the Baltimore railroad tracks to stabilize a total of 300 feet of track that was suffering from the same erosion problem. Again, proper evaluation was conducted using probes at various locations to determine the exact thickness of the rail bed, along with the extent of existing voids. The presence of water was found and verified at each location. 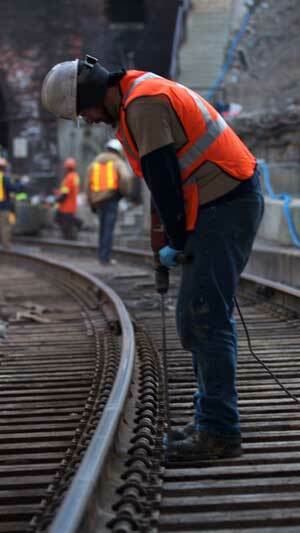 Laser level monitoring was again utilized to detect movement and ensure track geometry was left intact. The injection process was done in a precise manner and pattern so as to ‘redirect’ subsurface water around the railbed and towards an existing sump pump. During each of the track outages, URETEK crews were able to fill voids, eliminate water infiltration, restore proper water flow, and stabilize the railbed for between 100 and 150 linear feet of track in under 20 hours including set up, breakdown, clean up and final inspection by the customer. The project was completed within the tight track outage timelines established by the customer. The speed and efficiency of the URETEK crew and repair process allowed the customer to repair the area in the desired timeframe. The customer was able to get 4X the track length repaired within the same budget. Co-scheduling with other customer-related projects allowed for project completion without the need for additional track outage scheduling. Subsurface water was redirected and the railbed stabilized. The customer was very pleased with the effectiveness of the URETEK process and products, stating that URETEK set a high mark in professionalism and effectiveness during every project phase.